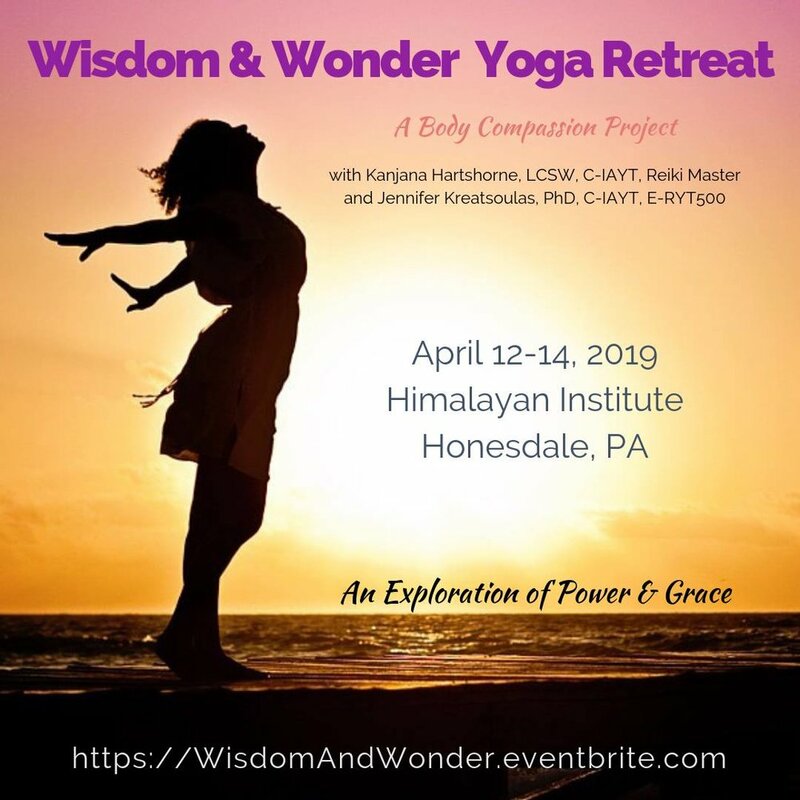 You are invited to join me and Kanjana Hartshorne at the scenic and peaceful Himalayan Institute in the Poconos April 12 to 14 for the Wisdom & Wonder Yoga Retreat, where you will explore how to rebuild healthy and compassionate connections with your true self – body, heart, and soul – by tapping into your unique power and grace. The theme of this year’s Body Compassion Project is Wisdom & Wonder. Inspired by participants of the 2018 retreat, these words capture the essence of empowerment, admiration, curiosity, amazement, and intuition. These values connect us to our personal power and enlighten us to ways of living with more grace. This year’s retreat will explore how to embrace wisdom and wonder in your relationship with your body. In a world that thrives on unrealistic beauty ideals and external validation, we can lose our connection with our personal power and feel discontent with our bodies. That’s why we’ve made it our mission to teach simple yet powerful ways to: practice compassion and connection with your body; experience more peace and grace in the unscripted chaos of life; develop mindfulness skills; and cultivate more appreciation for your unique values and qualities. Plus a private guided hike for our group, a Fire Pit Pondside party, and a Chai Tea welcome party. How do I relate to my body? How did my body image develop? How do my emotions affect my body image? How does my body language and body image affect my emotions? How can we use tools from yoga therapy to help us cultivate compassion for our bodies? How can we practice gratitude for what your bodies do for us? How do we give ourselves permission to pursue a life beyond external validation and be freed from superficial comparisons and judgement? What’s the difference between tolerance, acceptance, respect, love, and kindness? How do we move forward with connection to self and others? This retreat is appropriate for women who want to explore how to feel more confident and content in their bodies. Whether you struggle with body image because of your past, weight, race, size, ability, aging, illness, or more, we invite you to join us. No yoga experience is necessary. Body Compassion Yoga classes are beginner-friendly, gentle, trauma-sensitive and unique. 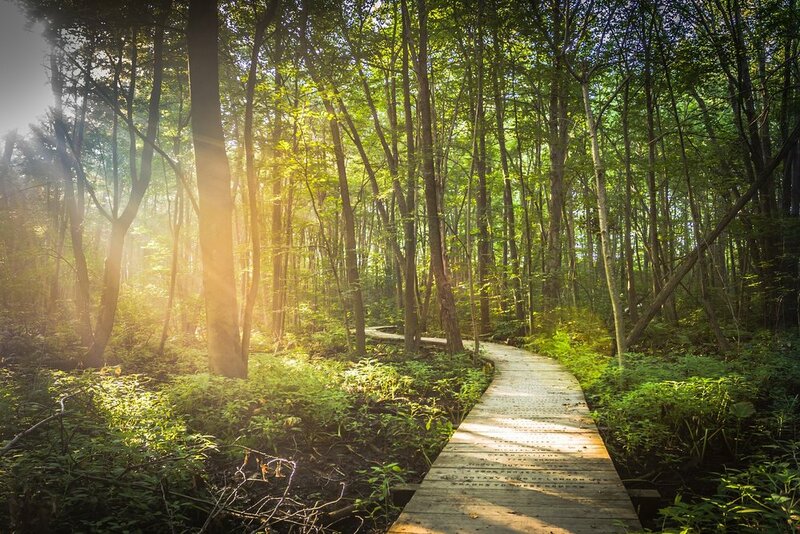 Building upon the themes of the retreat we use our bodies to turn inward, connecting to our innate wisdom and wonder. Our participants often comment on how different our yoga classes are compared to what’s offered in their community. The focus here is less on fitness and more on connecting with the self. “This retreat was an incredible opportunity to explore how my relationship with my body influences how I relate in the world. It was so healing to be able to disconnect from life and focus on me, all while connecting with other women struggling with similar issues. And I really enjoyed using yoga and creative arts to do this exploration. I hadn't touched watercolors since elementary school, and what a treat to be able to play with them as an adult!" ~Ellen L.
"I refer to retreat as ‘the weekend I didn’t realize I truly needed’. I was not sure what to expect even after registering for such a retreat, so I tried to go without any preconceived notions and keep an open mind. Within minutes of first introductions, I was put at ease as I could almost feel everyone exhale out their reservations and any anxiety. It was refreshing to be around such good-hearted individuals who had a similar goal of self-betterment. Space is limited, reserve your spot! Starts at $190 for a shared room and includes: vegetarian meals through the weekend, optional yoga classes and meditation/prayer groups, complimentary Wi-Fi, unlimited hot beverages in the Tea Lounge, and access to the Himalayan Institute’s picturesque 400-acre campus offers breathtaking views, scenic trails, and peaceful spaces for reflection and contemplation. To reserve your room call 570-253-5551 ext #2 to reserve by phone or visit the Himalayan Institute website. *10% Early Bird Discount Available Through December 1, 2018. *Continuing education units for Yoga Teachers registered with the Yoga Alliance. *Up to 11 CEUs for social workers, marriage and family therapists, and licensed professional counselors in PA and NJ. Other professionals who wish to pursue credentials in their field may contact Kanjana Hartshorne at Kanjana@HealingHeartsWellness.com to receive the detailed clinical description of the retreat. *Full refund for cancellations 60 days before the event start date. *Partial refund of $200 for cancellations between 30 and 59 days before the event start date. *Refunds will not be issued for cancellations from 29 days before the event. *We highly recommend getting travel insurance to protect yourself in case of emergencies. 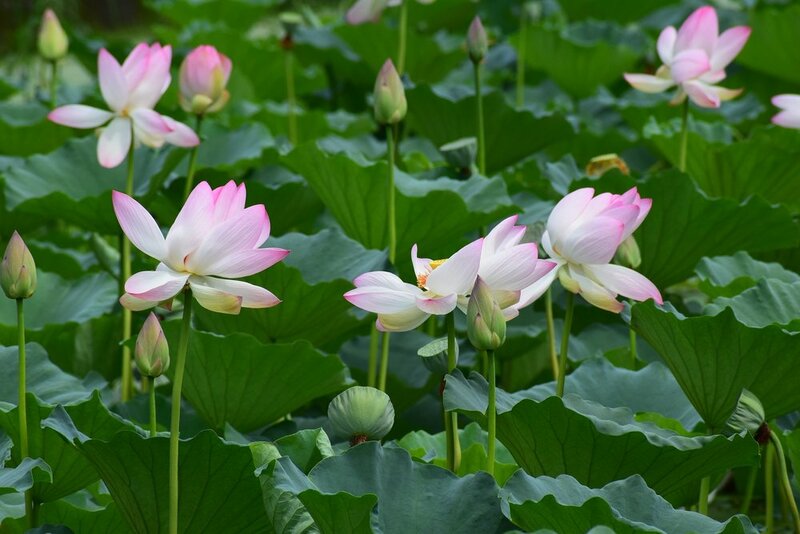 We would love for you to join us for the Wisdom & Wonder Yoga Retreat! Have questions? Feel free to get in touch. I will happily answer all your questions. *20% off for previous retreat attendees and group members. Get in touch to receive your discount code. *10% Early Bird Discount Available Through June 15, 2018. *Space is limited, reserve your spot! Jennifer Kreatsoulas, PhD, E-RYT-500, C-IAYT, is a certified yoga therapist specializing in eating disorders and body image. She is an inspirational speaker and author of Body Mindful Yoga: Create a Powerful and Affirming Relationship With Your Body (Llewellyn Worldwide, 2018). Jennifer provides yoga therapy via online and in person and leads yoga therapy groups at Monte Nido Eating Disorder Center of Philadelphia. She teaches workshops, retreats, and specialized trainings for clinicians, professionals, and yoga teachers. Jennifer is a partner with the Yoga & Body Image Coalition and writes for Yoga Journal and other influential blogs. She has appeared on Fox29 news and has been featured in the Huffington Post, Real Woman Magazine, Medill Reports Chicago, Philly.com, and the ED Matters Podcast. Connect with Jennifer: Connect with Jennifer: www.Yoga4EatingDisorders.com.